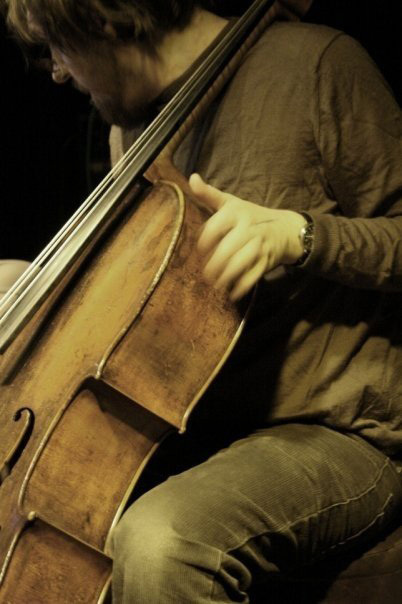 David Dhonau is a cellist, bassist and composer who has been writing, playing and recording original music for many years. His work spans and melds a range of sounds, from ambient electronica to folky pop; crunching hip hop to chamber music to improvised noise. His interest in the visual arts and the written/spoken word has resulted in collaborations with a range of practitioners and performers. He has participated in video installations, poetry and dance shows, and experimental ‘drone operas’ as well as regular conventional gigs. David has also been privileged to witness the power of music as an uplifting and liberating influence, particularly for the socially excluded. This is the focus of the Midlands based ‘Showcase Smoothie’ Project which involves working extensively alongside young people with varying experiences of mental illness. He has worked as the composer on the project since its foundation in 2008. As a composer, arranger and session player his work has been favourably reviewed in NME, The Wire, Uncut, Muzik and the Sun. Live performances have taken him to Covent Garden’s Royal Opera House and festivals such as Tramlines and Summer Sundae. He has had recorded work featured on television programmes such as BBC3’s ‘Ideal’ and Channel 4’s ‘Hollyoaks’. David is based in Leicester, UK. He is available for session, composition and production work.